Does Doomsday look more like Abomination or a Cave Troll? The trailer for Batman Vs Superman: Dawn of Justice provided the first look at the film's final villain, Doomsday. 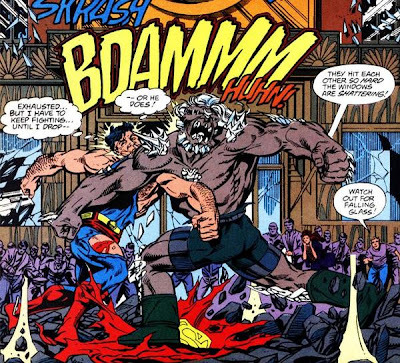 Doomsday is an infamous comic villain known for killing off Superman in the Death of Superman story. In this version it seems that Lex Luther will use the body of General Zodd to create Doomsday. Much of the praise and criticism of the trailer for the film now is aimed at the appearance of Doomsday. A few people on twitter have called out the look of the character as being too close to the Cave Troll in Lord of the Rings, and Abomination from the Incredible Hulk film. I think he looks pretty good. I certainly recognize him as Doomsday. One thing that could make him a little more intimidating would enhancing the bone structures around his face and head. That might help him stand apart more. The original comic version also had white hair that stood out and helped hide his large head. This Doomsday does resemble the Cave Troll to me. I personally think he looks very different from Abomination though. Here are some examples what do you think?